The first bibliography, history and review of South African fly fishing books from the 1908 to the present. TO LEARN MORE SIMPLY BUY THE BOOK! 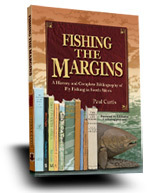 PAUL CURTIS has been fishing all his life and collecting books about fishing for thirty years or more. Fishing the Margins is the result of his collecting mania and several years of research in the history of South African flyfishing.